Have you wept more tears than you knew existed? Maybe you dread facing another day without the one you love. Perhaps the test results came back positive, or your bank account doesn't account for much. There's no escaping it - the challenges of life can be overwhelming. But when your source of hope comes from the Source of all power, you will experience His new mercies in each new day. One day in the life of Christ. Call it a tapestry of turmoil: A noisy pictorial in which the golden threads of triumph knot against the black, frazzled strings of tragedy. Call it a symphony of emotions: A sunrise-to-sunset orchestration of extremes. One score is brassy with exuberance -- the next moans with sorrow. Whatever you call it -- call it real. 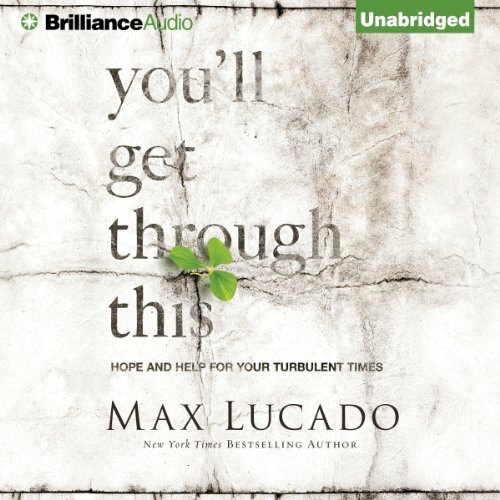 ©2013 Max Lucado (P)2013 Brilliance Audio, all rights reserved. This book was very much worth making a review. 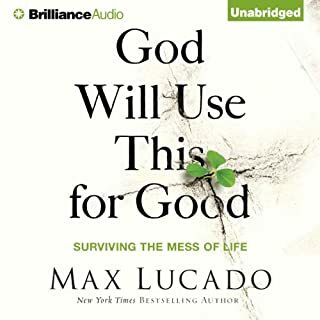 I read a lot of Christian material but this was my first Max Lucado book. I have heard of him and some of his material but this was the first full book. He tackles what is a very tough issue in a very biblical way. If you know the Lord and you are dealing with something very painful I highly recommend this book. Even if you aren't (at the moment) it is a great resource to go deeper with who our Father in heaven is, what he did for us thru His son Jesus Christ, who we are and how he wants us to know ourselves and him. I will listen to this again for sure. Finding the courage to keep going. What made the experience of listening to You'll Get Through This the most enjoyable? Hearing that trials may come but there is hope and God will bring you through. Just like God was with so many other's who wen through trials like we do and others who failed throughout the bible and God is still faithful to forgive and rescue. We may not understand why the circumstances of our lives are in such turmoil, but we can rely on the one who does! We will get through this and we know that the infinite will reach own and touch the finite and we will make it through to the Glory of God! AMEN!! The stories of Joseph, Jesus, King David, etc....each one waiting 20, 30 or more years to see the start of their ministry or the victory and deliverance God had for them, including God's own son. He waited 33 years to start His earthly ministry. Only in His death was the fulfillment of God's most gracious gift of all to man. Salvation fulfilled. Just because we are waiting doesn't mean that we are not in God's will. He has a calming and clear way of reading. Smooth transitions and appropriate inflections that made it flow instead of choppy. Also giving the listener the ability to decide for themselves what was important to terms of what has important to them instead of feeling like you were being preached at I was able to flow along with the story, stopping where I wanted to and allowing the message to inspire my own understanding and speak specifically to the issues in my own life. Ability to identify where my life reflected those being represented and hearing the messages that were relevant to my own life without being distracted by the reader's own idea of what was important. I would say that the most poignant moment for me was when I realized that every trial in my life that I have experienced and was afraid that the pressure and stress would kill me, and then it would get to the point where I was upset that I didn't die, were not in vain. God was able to take each one and I not only did I survive but I was able to move forward stronger and wiser than before. I realized the more I depend on God, doesn't make me weak as some would say from a worldly perspective, but actually is wise because His strength is the most evident when it replaces my weakness. Just like Joseph, my trials may seem long and wearisome, GOD is still in control and working it out for my good. If you are struggling with not just one trial, but one after another, and growing weary of the battle, trust the God who is able to not only deliver and restore you but actually able to bless you way beyond what you could ask or think. 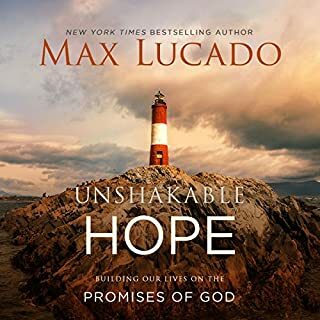 Thank God for righteous servants like Pastor Max Lucado, who are willing and faithful to share the messages that the Holy Spirit inspires to help encourage the international family of Christ believers navigating this world with all it's ups and downs. Reading this book will bless your life. I listened to this book straight through a couple times because I'm going through a difficult time right now. Max's writing is very encouraging. 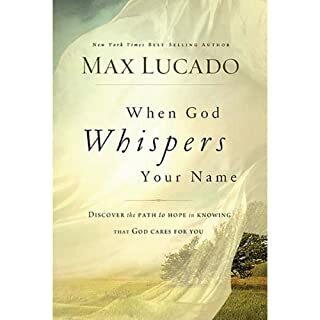 If you're unfamiliar with Max Lucado, this book is a great place to start. Wayne Shepherd is a superb narrator. I enjoyed listening to his soft, encouraging voice. A year ago I had an aortic dissection. While I survived this horrible health crisis when many do t, it caused me to have a major stroke. A portion of my brain is permanently damaged, affecting the left side of my body. I spent 9 weeks in the hospital and inpatient rehab. I can walk with a cane but require a wheelchair for distance. I can’t do much with my next arm and hand. However through it all I have seen God do some amazing things. I have a “squad” of about 50 friends and church family members who have been helping me with housework, meals an transportation to my rehab and doctor appointments. My husband has stepped up in amazing ways to care for me. My daughters persevered through the ordeal. However when it became apparent I would not make the full recovery we hoped and prayed for, grief, anger and depression set it with my family. My husband has been questioning how a good God could have allowed this or maybe even caused it. He is feeling less faith in God so I started looking for answers in the Bible. 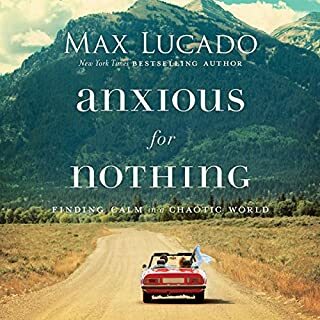 Then I found this book and Max skillfully weaves scripture with modern examples of how Hod uses everything for good and helps us get through the trials we all experience. I highly recommend!!! Max keeps truth simple and so comforting. I have listened to this book twice. It helps me focus off the problem and on Him. 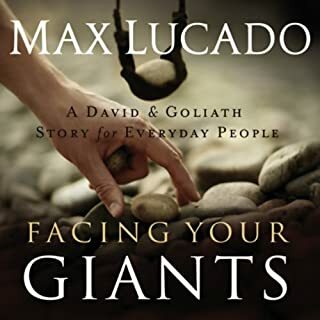 Thank you Max Lucado! “Lucado” is one of God’s blessings! Lucado were some of our textbooks authors in college. I have forgotten how much I love his books. I keep the hardbacks on my shelf. I have referenced them in management meetings. After experiencing a very tough year, fraught with disappointments and betrayals what I needed most was a reset. I needed the affirmation that being a good, giving person and working hard to make everyone’s life better is not a foolish philosophy. 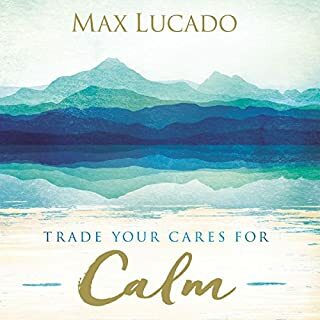 Max Lucado has an amazing ability to cut right to the true meaning and implementation of God’s love and his loyalty to us. Practical advice if we can only filter out the false narratives of our “frenemies”. Thank you for knowing what we need before we do and saying it so eloquently! Will definitely treat myself to more! I’m so thankful for our Awesome, Amazing, Almighty GOD!!! Thank you Lord for gifting Max Lucado with such writing talents! I just finished “You’ll Get Through This” and absolutely loved it! Such a talented and uplifting writer! Praise God! Mr. Lucado’s books always remind me to keep looking up to Our Heavenly Father!!! Great book! A lot of references from the message "bible"
Loved the book, great advice, lessons to be learned, and focus on the bible. Didn't like the use the the message "bible" - I would not even call that a bible. Maybe a commentary, at best. So many insights that I never thought about before. A good read/listen for anyone who wants to grow in their faith. This book help me understand that all things work to the good of those that love God. I enjoyed this book so much, I love the story of Joseph in the Bible. I saw the story being taught by Max on TV twice now and i was engaged to hear what he had to say so I just had to purchase it. It was just what I needed to hear. It's creative how he blinds the stories in the Bible and everyday people and ensures your story is not left out. A perfect encouragement for hope of great things that can come out of your own pain.